–noun 1. bearing, conduct, or speech indicative of self-respect or appreciation of the formality or gravity of an occasion or situation. I witnessed this dignity in a homeless man this past Monday night, and as we start this Thanksgiving/Christmas season, I keep thinking about him. And about the way things fall right into place, just the way they are supposed to. This past Monday, we visited our homeless friends on the streets of Los Angeles. Our monthly homeless outreach has been going strong for three years now. With the decline of the economy, we are seeing even more homeless on the streets. As usual, we were equipped with soup, water, snacks. We had a full pickup truck of clothing, and by a kind donation we also had some emergency mylar blankets and ponchos. We pulled up to our first stop around 8:00 p.m. 4th Street and San Pedro. There's a small encampment there of people living in boxes (if they are lucky to have a box), and on the sidewalk itself. It's cold. A man came up to me and asked if I would have a pair of shoes for him. He said he had shoes, and if we didn't have any, that was fine. But his shoes were canvas, and it had been raining.... No worries. I set out to the back of the pick up to find him some shoes. Digging around, I found a pair of leather high top shoes. I held them up. "Can you use these?" He looked. He smiled. He said, "Those look great. I hope they fit. I won't take them if they don't though. Let me try them on." I grabbed him a pair of socks, and he set out to try on the shoes. In the meantime, I asked him if he could use some soup? an emergency blanket? how about a poncho. "I'm good," he said. "I have everything I need. But thank you." The shoes fit. He was smiling....and stomping around in the shoes. Then he did something very few on the streets would do. He handed me his canvas shoes, and said, "I'll donate these to you. They're worn, but someone else can make some use of them. Oh, and I'd like to give you a donation." When I thanked him but said it wasn't necessary, he said, "Oh, no, I know it's not necessary, but I'd like to. It's important that we help one another. And your group is here helping us." He pulled out $2 from his pocket and handed it to me with thanks. "God bless you guys. And Happy Thanksgiving to you." Wow. I was touched by his manner. He looked like all he had was the clothing on his back and the new shoes on his feet. But he was happy. He didn't want to take, without giving back. Yet he was worn. You could tell he had been on the streets for a long time. The man had dignity. The evening went on. At each of the stops we fed and clothed. I met a man that couldn't speak, and we had a little fun as he would point at various items of clothing and try to "ask" me for certain items. I'd get a thumbs up if I guessed correctly....and a smile. I had a great time with our crew, two of which were first timers. At each stop though, I would try to find some feet for the canvas converse shoes that were donated so generously. But no takers. At our last stop, the lines for food were huge. Hungry people lined up as our crew poured hot water into the cup-o-noodles. At the pick up we were busy finding clothing for people. We never have enough warm clothing, the need is so great. But we actually did have enough where everyone who approached us got something. When the lines had died down, we announced it was time to pack up. That's when Selin, our newest crew member, asked me in Armenian, "Do you think you have some shoes and socks for this man? He's barefoot." I looked to find a man, standing in shorts and a tshirt waiting for soup. The shoes! I ran back to the truck. It was almost empty, but the shoes were there along with a few pairs of mismatched socks. By the time I returned the man was gone. Luckily, Aram had seen where he went. He was back in his box. The two of us went to this man's home and knocked on the box. He peeked out and we offered him the shoes and socks. And they were perfect. When I think about how it all worked that night, I don't know why I shouldn't expect it to work out that way from the beginning. Through God's grace, all things are possible (and probable). The man that donated the shoes at the first stop had a reason for doing so. The fact that there wasn't a match for them at our other stops was also meant to be. The barefoot recipient of the shoes was supposed to be in line, barefoot. And Selin, being new to our ministry, was supposed to be right where she was, distributing the soup and taking it all in, in order to take compassion upon this man and ask that we might have shoes and socks for him. It's an amazing chain this way. Everyone has something they can give: be it a smile, a thank you, a pair of shoes, a compassionate heart, a kind word, an ear to listen. And what happened to the $2 donation? At our church we have a prayer box. Each Sunday, prayer requests are read during the divine liturgy and we pray for those mentioned. A donation was made with the $2 for the Hungry and the Homeless of our city. My prayers are with them for sure. This Thanksgiving, I am thankful for the opportunity to learn some very valuable life lessons from those who have nothing but their dignity. They have so much. Pomegranate & Eye at Armenian Art Night this weekend!! If you've got friends in the San Diego area, please pass along the info. Admission is $25. which includes wine and cheese/hors d'oerves. Hope to see you there! Last night's homeless outreach to Skid Row was no different than any other month over the past three years that we've been feeding and clothing the needy on the streets of Los Angeles. Here's how it works: Our usual three cars pull up to a populated street at about 8:00 p.m. Trunks pop open to reveal clothing collected throughout the month, soup, water bottles and snacks, Bibles in English and Spanish. By now, our friends that live on the streets know us. They know that the orange car has the food. They know that the girl with the infectious laugh will find something for them to wear or keep warm with. They know that if they come up and talk to us, we'll listen. And they know that we'll try to help if we can. Over the course of three years we've seen and heard a lot. Our hearts have broken when we listened to an elderly Italian woman tell us her story of how she had ended up homeless and living in a box on the corner of Los Angeles and Fifth. "I was like you," she said. "I was the one giving food to the homeless." It grabs you in the gut. The saying, "There, but for the Grace of God, go I," comes into play, and you realize how fragile life is. How important family and friends are. How we are all THERE on the street if it wasn't for the support systems that we have, be they friends, family, faith, etc. And because of that, you want to be there for them. We've experienced miracles: We were passing out our usual fare of soup and snacks one evening when a man approached and asked if we had any salad. We thought this was funny at the time. "No," we said, "sorry, but we have soup...would you like some?" "No thank you," he answered, "but would you have a sandwich? I'd really love a sandwich." "Sorry...this is all we have, but you're welcome to it." The man left. Two minutes later a car pulled up. This couple had gone to Starbucks at closing and asked for food donations to distribute to the homeless. Seeing us, they pulled over and asked if we could tell them some of our stops. We asked what it was that they were distributing. "We have some salads, and we have sandwiches." My friend Suzie and I just looked at each other dumbfounded. Could their timing have been more perfect? We called over the man that had asked for the special order and he was all smiles. So was this God's miracle? No. But what happened next was. Our friend took the salad and the sandwich, raise it up, closed his eyes and thanked God for the blessing. That was the miracle. He knew what he wanted, and God knew what he needed. It was provided for him, and he - despite all his hardships, his lack of a home, a place to sleep, clothing to wear - knew that his needs were met through God and he was grateful. I had a man come up to me last night and give me a $2 donation. This was probably all the money he had. He was transplanted to Los Angeles from Chicago. He had come here to see if he could make a go of it. It hadn't worked out and he found himself on the street. Our new volunteers got to witness this man's generosity. He gave them the donation, but they didn't want to take it. Clearly, he was in need. When I walked by, they handed it to me. I thanked him and asked him his name. "John. My name is John." I offered him soup, water? Maybe a tshirt? "No, I'm fine. I'm good. I just wanted to make a donation. Where are you all from?" I told him we were from In His Shoes, the outreach organization of our church. He said, "Well, it's good what you're doing. A lot of people complain about the homeless...but you are out here doing something about it. God bless you. Thank you." This is not uncommon. Our evenings on Skid Row are filled with grateful smiles, warm hugs and blessings. And I always come home not feeling like we've done something great, but feeling like I've received something amazing. I think those of us that are "regulars" know what I mean. We're hooked. We get so much more than we give. We get to experience genuineness at it's most basic level, smiles, tears, hugs, emotion, humanity. And we get to share in the LOVE that is so unconditionally given to us by God. It's been a few days since Sunday, but I keep thinking about her, about us, about the importance of community and support. About prayer. About faith. And about miracles. This past Sunday I was introduced to a young mother. I didn't know this woman at all...not face to face, but I knew her through faith. A month ago we sat in church when Fr. Vazken stopped the service, turned to us and asked the entire congregation, at that moment, to pray for Parik. She had gone into labor but things had gone wrong. Baby was delivered and taken to one hospital, while Parik lay in a coma for nine days! We have a prayer box at our church where people can drop in their prayer requests throughout the week, and at a point in the service, our priest will mention those names that need our prayers, and to ask God to grant them. But this Sunday was different. We were asked as a congregation, as a family, to please pray for Parik. I asked my friends after church if they "felt it". I know I did. When everyone was in prayer collectively, it was different. My skin tingled at that moment, and I "KNEW" that she would be okay. Hard to explain it...but that was the feeling. The following day I asked Fr. Vazken if he had heard any news. "No. But I don't want to call." He explained to me that the act of calling would in a sense be almost like we were doubting -- checking up ---if our prayers worked. We had put in the request....now we just needed to continue, and most importantly, to believe. Wednesday night at our Questions in Faith meeting, he made the announcement. "I received a call today. She opened her eyes." She was in a coma for nine days! She pulled through and was going to be okay. That was two weeks ago. This past Sunday, we had a huge crowd at church. Afterward, we were outside talking when Fr. Vazken came to me, pointed out a pretty young woman and her husband and said, "That's Parik." It didn't register for a second, and then POW! I couldn't believe it. She looked normal, healthy, her husband - quiet and shy. I went up and hugged her. Poor woman, I don't really know what she thought. I introduced myself. "I'm so happy to see you here! We've all been praying for you! How are you? How's the baby?" I really felt like I knew her. People had started coming over, one by one, hugging her, giving thanks to God, welcoming this young mother and father as our own. She said, "The baby's fine. I'm so blessed, I have my son now." Soon we were all emotional and crying, "Happy tears," in Parik's words. So what's the miracle? Is the miracle that she survived a coma after twelve days and is alive and well? Well, yes. But the bigger miracle is the transformation that happened to a group of faithful at our small church on the corner: It was the feeling of belonging...we were a church family and were in this together. It was genuine caring and concern for another human being in a day and age when we just don't hear that in the news. It was the renewal of faith and our belief that through God all things are possible...if you let go, and believe. Why the Eye? Why the Pomegranates? As far back as I can remember, I've always had to create. My parents always encouraged my creativity, but it was my father that would spark my imagination. We grew up in the heart of Los Angeles in the 60's and 70's. Back then there were just a handful of Armenians. I remember my mom driving us to Glendale for piano lessons after school. We had to make sure and turn right around and head back home before 6:00 p.m. because we were minorities and had to be off the streets after that time. Seriously. But we grew up proud, embracing our culture and its traditions. One of the traditions that always intrigued me as a child, was the use of eye beads. I'd love looking in the display case at the eye beads. They were always staring back...so creepy. When babies were born, you'd pin an eye bead on them to ward off the "char atchk" or evil eye. The evil eye was defined as the jealousy that someone felt toward your good fortune. People wore a single eye bead....or a bracelet of eyes. Sometimes it wasn't even an eye bead but just a blue bead. Back then they were called "donkey beads". I have no clue why. In 2007, I started my online jewelry business : Pomegranate & Eye. I wanted to create jewelry with eye beads, but didn't like what was out there. So I designed my own beads and have them made especially for me. They are lampworked, highly detailed, glass beads, each made by artisans. 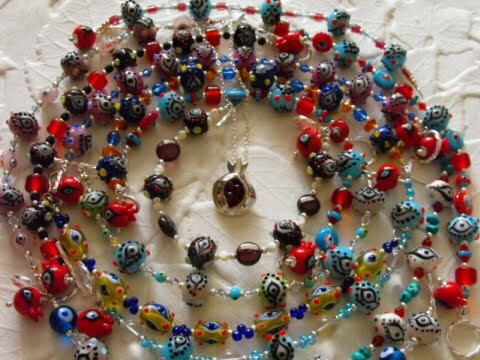 I create bracelets and necklaces with these beads, and I also work in fine silver creating my pomegranates. The pomegranate is the symbol of Armenia. It is the symbol for abundance, prosperity, fertility and creativity. I guess I started looking into pomegranate jewelry when my brother brought back a small wooden pomegranate from Armenia. I love the shape of the pomegranate, and as kids, we would love when my medz mairig would split one open for us. Seeing that there was no fine jewelry out on the market in the shape of a pomegranate, I started working on creating them in fine silver. Each of my pomegranates is handmade and unique. I don't use molds and so no two are alike. I sculpt the pomegranate, sand, and torch fire it. The seeds are Czech glass and fuse together in the firing process. Then there's the burnishing, polishing, tumbling. It's a process, but I love it. Each pomegranate is made with love. And then there's the little Pomegranate & Eye bead. Each of my bracelets has a little red pomegranate bead charm. This is my wish to you for an abundance of life's blessings. The little bead is shaped like a pomegranate and has an eye on it (the Pomegranate & Eye logo). So there you have it. Wishing you a very Pomegranate Day - filled with abundance, prosperity and creativity!